BDAC diabetic insoles provide an outstanding fit with a deeply cupped, stabilizing heel and moderate longitudinal arch. The two-layers design provides relieve to insensitive diabetic feet. The top layer and bottom layer are made from special material which is elastic and redistribute pressure away from prominent lesions. The nature heat and the pressure of the foot molds the top layer for a conforming fit, and the bottom supportive layer add supports and keep its shape. The insoles can be trimmed with scissors to fit any shoes. 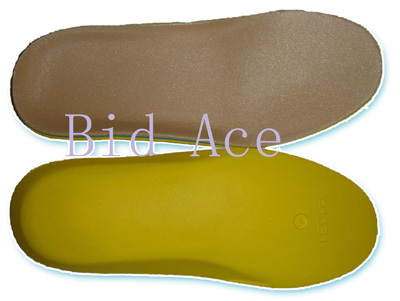 BDAC diabetic insoles provide an outstanding fit with a deeply cupped, stabilizing heel and moderate longitudinal arch. The three-layers design provides relieve to insensitive diabetic feet. The top layer and bottom layer are made from special material which is elastic and divert pressure from Achilles tendon area. The nature heat and the pressure of the foots molds the top layer for a conforming fit, the middle layer which is made from poron material absorbs shock and will not bottom out, and the bottom supportive layer will keep its shape. The insoles can be trimmed with scissors to fit any shoes. BDAC diabetic insoles provide an outstanding fit with a deeply cupped, stabilizing heel and high longitudinal arch which supply arch support. The two-layers design provides relieve to insensitive diabetic feet. The top layer and bottom layer are made from speical material which is elastic and redistribute pressure away from prominent lesions. The nature heat and the pressure of the foot molds the top layer for a conforming fit and the bottom supportive layer adds support and keep its shape. Insoles can be trimmed to fit any shoes. BDAC diabetic insoles provide an outstanding fit with a deeply cupped, stabilizing heel and moderate longitudinal arch. The three-layers design provides relieve to insensitive diabetic feet. The top layer and bottom layer are made from speical material which is elastic and distribute pressure away from prominent lesions. The nature heat and the pressure of the foots molds the top layer for a conforming fit, the middle layer which is made from poron material absorbs shock and will not bottom out, and the bottom supportive layer will keep its shape. Insoles can be trimmed to fit any shoes.